I have been painting a lot of nudibranchs lately. 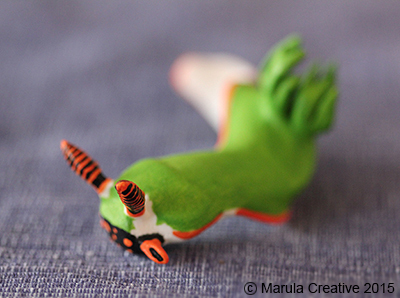 As I was painting a “Yana” nudibranch today I took photos of each stage of the process to show you how I do it. I find the more I paint the more I learn and I want to pass on what I have learned so far. Yana is Nembrotha Kurbayana also known as the variable neon slug. She is a tropical nudibranch found in the Indo-West Pacific. She can grow up to 120mm (4.7 inch) in length. 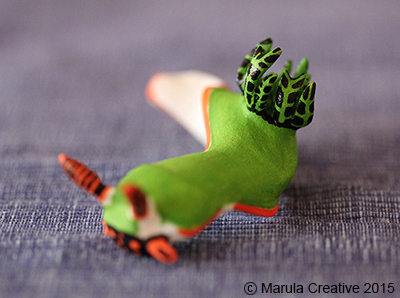 She is mainly black with orange and green patterns. These can vary a lot. There are either lines with an uneven edge or different size spots of green on the body. The foot has an orange lining that runs all along the side of it. Sometimes you will find a few of the spots or lines at the very back of the foot. These are orange as well. The rhinophores and gills are orange or green. The beauty of painting nudibranchs is that there is so much variation in nature that what you paint probably exists somewhere. 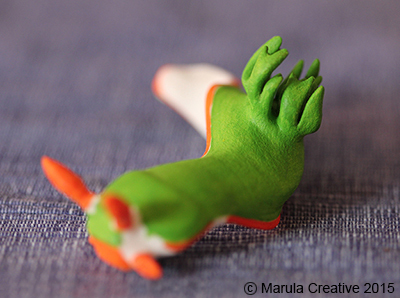 I start with a polished white strong and flexible nylon plastic from Shapeways. 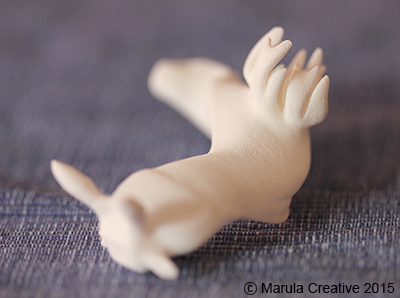 I use this material because it has the strength required to reproduce some of the finer details found in nudibranchs. It gets printed layer by layer which leaves printing lines in the model that need to be polished off. I find the Shapeways polishing process is pretty good. This is an automatic process so I always check to make sure all the printing lines are smoothed over. If I need to tidy up the surface I use a nail file. The material comes ready to paint out of the box so the models don’t need to be washed. The first painting I do is priming. This is important as it ensures that the colour coats have something to stick to. Only one layer is needed, but since there are many corners I give it a quick once over check to make sure I didn’t miss a spot. I use a spray primer to get a thin coat with no brush marks. With the model primed the next step is to apply the base colours. This is where I start using acrylic paints. I personally prefer to use the primary colours (cyan, magenta and yellow) so that I can mix my own colours. 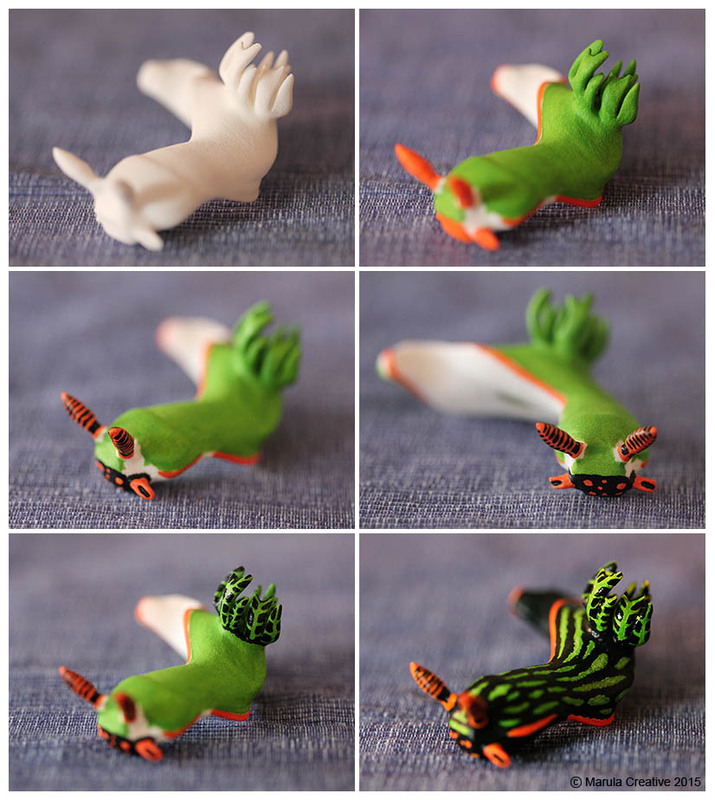 Before painting I like to collect together a number of different photos of the nudibranch I am painting. This gives me a good idea of the colour hues that I need. This way I can also see the variation in the patterns and from this decide what pattern I want to reproduce. There are a lot of great photographs available on the internet from professional photographers who can capture stunning detail through to enthusiastic amateurs who show the variation that there is in nature. I have these photos on the computer screen in front of me as I paint. When painting it is really important to understand how the colours are going to interact if they are mixed or overlaid. This comes down to the opacity of the paint. Opaque colours can be painted on top of other colours without the lower layer showing through. Translucent paint will require more than one layer to block out the colour below. I often paint with white on top of a colour first before applying the next colour. The white I use is a more opaque paint than the colours so blocks out the underlying colour and provides a white base for more vibrant colour. The black I use is also opaque and can be painted on top of colours without them showing through. This is why I start painting the lighter orange and green colours first. I avoid painting the orange and green on top of each other as it creates a muddy colour. Fortunately Yana has black between green and orange in her colouration so at this stage I can leave a gap between the two. I also just leave spaces in the base coat where there will be a lot of black. I don’t mix water with the paint. 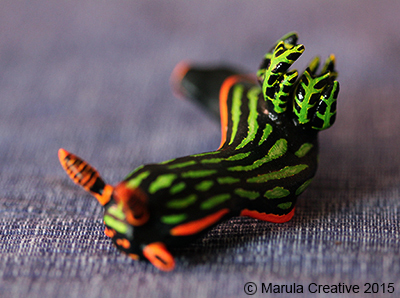 This is so that the colours stay vibrant, in keeping with the colours we see on nudibranchs. With the base coat I am looking to create a smooth colour. I am careful to smooth out all the brush lines of paint as I put them down. This is so they don’t appear as raised areas when they dry. I apply only a single coat of each colour. This results in a bit of variation in intensity. I like this as it makes the colour look more organic and natural. When the base coat is finished and dried I move onto the rhinophores and oral tentacles. Rhinophores and oral tentacles are scent, taste and touch receptors. The rhinophores are orange with thin black lines. The rhinophores are small and the black lines are very thin. This makes this step quite tricky. You have to use a fine brush and have a steady hand. You may go back and fix up areas by painting white and then orange or multiple orange layers. It does look better as a first time painted line though, so I try to avoid it. Next I paint the gills. The model could not be created with very fine lines on the gills since this material requires a minimum thickness of 7mm (0.28 inch). I rather paint the details in myself and create the illusion of it being thin. The final painting step is creating the final body details. For Yana these details are the green stripes along her back. I create these stripes by over coating the green base coat with black paint. When I first started painting this type of nudibranch I created the stripes by painting all the green lines and then painting the black around it. It took a long time, so I tested the black on green and it looked fine and was much faster. The green lines have an uneven edge which I carefully paint with a fine brush using the black paint. I also add a slight highlight, with a lighter green colour, in the centre of each line to make it look more raised-up. I use a very fine brush to paint all the fine lines. Unfortunately you can go through a number of brushes since the hairs start falling out over time when washing the paint off. So you end up starting with a wider brush that ends up as your thin brush. Make sure to wash the paint off immediately since the plastic consistency of the acrylic can make the hairs break off when dried. Finally I put a coat of varnish over the entire model. This helps to protect the coloured layers from damage, increases resistance to water and can be wiped with a cloth in case there is dust build up. Varnish also imparts a shiny look to the surface which is what we expect from seeing them in the water. I will write more blogs about how I paint other nudibranchs. They all have very different designs and patterns so you end up using your brushes in different ways. I will write more about soft gradients, interpreting a pattern as brush strokes and adding texture in future blog posts. I hope this helps to explain how to paint one of these models. If you do struggle with anything please get in touch. 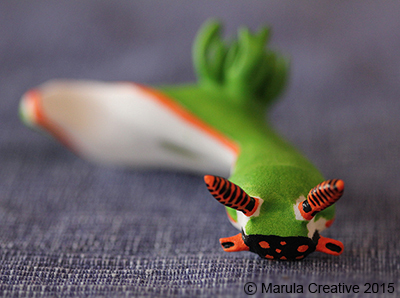 I’d also love to see photos of the nudibranchs you have painted!